With May’s General Election campaign receding into past memory, there has come a timely reminder from press regulator IPSO of the less than totally honest behaviour exhibited by some of the candidates, as an adjudication has been published regarding a complaint made by Tory MP for Mid Bedfordshire (yes, it’s her again) Nadine Dorries. And one look at the adjudication shows that this was one campaign that developed not necessarily to the Fragrant Nadine’s advantage. During the run-up to the election, the Sunday Mirror had run a story titled “TORY NAD STALKING ROW WITH VOTE RIVAL … Police probe Tory’s ‘harassment’ blast”. 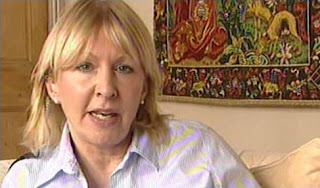 The article detailed the varied and creative allegations made by Ms Dorries against the serially tenacious Tim Ireland. The piece also asserted that there was a Police investigation in progress following complaints received in the wake of a hustings event at Shefford, which Ms Dorries did not attend, but at which a number of her supporters turned up and distributed leaflets which made allegations about Ireland. These, shall we say, were not factually correct, and gave every appearance of being highly defamatory. IPSO, on this occasion, was not pronouncing on the nuances in the Editor’s Code of Conduct, but on a straightforward matter of accuracy, that being whether a Police investigation was indeed in progress when the paper published its article. And, as the Guardian has reported, “The regulator found that the paper’s report that Dorries was at the centre of a police investigation was accurate”. There was more. “Dorries said that no such investigation could have been taking place because any allegations that she had broken electoral law would have had to be referred to the police by the returning officer, who would only do so after the vote on 7 May. But police repeatedly confirmed to the Sunday Mirror that they were investigating allegations into Dorries, Ipso found”. It got worse for the MP. “Dorries also complained that the story … was inaccurate because it reported that police had produced a report clearing the other candidate - the blogger Tim Ireland - of having harassed her on different occasions in the past … She said that the document on which the paper was relying, which Ireland obtained under data protection laws, only took into account the professional view of a single officer”. However, and here we encounter a significantly sized however, the Sunday Mirror checked its story with the relevant Police press office, and the IPSO findings note that “The police had … confirmed that [Ms Dorries’] concerns about [Ireland] had been investigated and passed to the CPS, but that no evidence of an offence was found”. Moreover, this was not the only recent Dorries complaint about Ireland that IPSO has thrown out (see HERE). Those papers that have given Nadine Dorries the opportunity to peddle her claims against Tim Ireland might do well to peruse this latest adjudication before humouring her again. You can see Richard Bartholomew’s take on these events HERE.